Being so close to Memphis it’s hard to escape Elvis fever. My nine-year-old is a big fan of his music (she doesn’t know much about him yet, so she doesn’t know that some parts of his character are not role model worthy for kids, we just focus on Elvis as The King of Rock ‘N’ Roll for now) and with today being the anniversary of his death, we had to commemorate The King. For breakfast we had Elvis muffins (banana muffins with peanut butter and chocolate chips – mmm!) and those also made their way into the lunches. 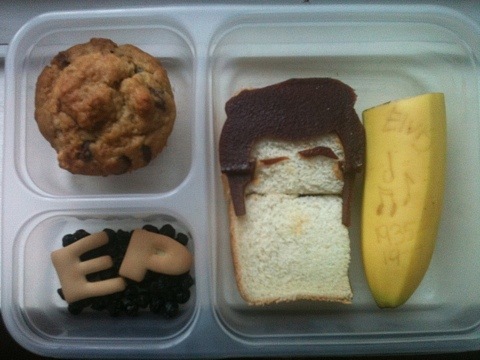 Jaiden also has the letters E and P for his initials (Jenna has 1, 2 and 3 for “One for the money, two for the show, three to get ready …”) and under the letters are dried blueberry “blue suede shoes.” Her sandwich is Elvis’ favorite, peanut butter and banana (we skipped the fried part), with fruit leather hair and eyebrows (the lips were too difficult to cut out of my fruit leather scraps – they looked more like a beak that his famous lip curl). I used a fork to etch “Elvis,” music notes and “1935-1977” into the banana peel and it will be dark brown by lunchtime. Jaiden LOVES it. The other kids had similar lunches in that they each had the same sandwiches and each had a banana, but due to their tendency to be finicky, some had muffins, some had carrots, some had grapes, some had Babybel cheese. I am totally over hearing “I don’t like this!” all the time; my middle two kids are the worst with it (my bookends are pretty easy to please with food). The fruit leather hair, I think, really makes this bento! While searching for inspiration photos last night I ran across Elvis hair clipart and printed it out (sized to fit) to trace on fruit leather with a knife. It was super easy that way.I should have cut the sandwich into just halves (instead of quarters) though. I think this is my favorite bento so far. 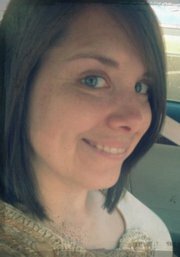 I’m super proud of it. Jaiden told me, “Mama, you’re so creative with food …” Not entirely, but one day I hope to be. That’s a hunk-a-hunk of burning bento, Baby!